Another night of packing for the move and with the hubby out doing grown-up stuff I was left alone for dinner. 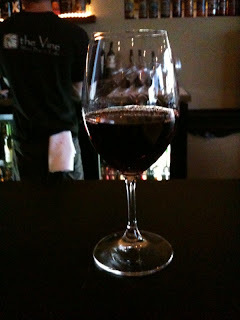 Since it has been quite a while I walked down to The Vine for a quick bite and sample a few wines. I opened with a comparison of two Pinot Noirs, Handley Cellars 2006 Pinot Noir, Anderson Valley and 2006 Talisman Wines Thorn Ridge Vineyard Sonoma Coast Pinot Noir (see picture on the left). At the onset they seemed virtually identical in color and nose, hints of strawberry, spice, and a bit of clove. Boy, it going to be hard to differentiate them. But as always, time told the true story. While both wines started out extremely close in terms of nose, body, taste, and finish, time was not so kind to the Handley as it was to the Talisman. After a bout 20 minutes it seems virtually everything was gone from the Handley while the Talisman continued to open up to provide a lovely little Pinot with good acidity, lean but not racy, soft but slightly dry with a medium length finish. After this comparison I was convinced to try something different. 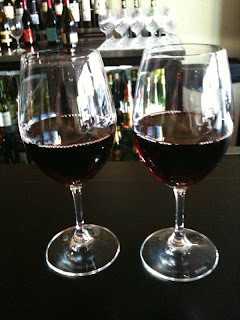 The server poured me a sample of 2002 Chateau Musar Hochar Père & Fils, a wine from Lebanon. This wine is blend of the "three C's", Carignan ,Cinsaut, and Cabernet Sauvignon. The nose was lovely, like a strawberry wrapped in licorice accented with rose petals. I detected a hint of petroleum and earthiness (which I attribute to the fact that it is unfiltered). The wine is medium bodied but round with a slightly thick texture (again, probably because it isn't filtered) with smooth tannins and just enough acid to support the other components. A surprise what was pleasant!